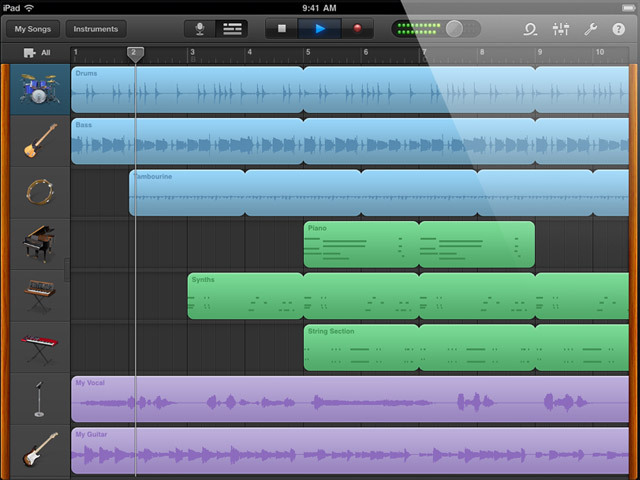 This is Apple's famous GarageBand app designed for the iPad, iPhone and iPod Touch. It is a cut down version of GarageBand '11 and is fully compatible with the OSX version. GarageBand is a full featured music production suite. It can turn your iOS device into an intelligent multi-instrument platform, you can use it to recorder and sample, you can add a variety of effects, finally you can mix and master your music with ease. Turn your iPad/iPhone/iPodTouch into pianos, organs, guitars, drums, basses and other musical instruments using the Multi-Touch gesture screen. Has a large range of Smart Instruments that assists you in making music, making the Garageband app easy to play and improving the created music. GarageBand iPad Midi control is allowed via external devices. Supports Bluetooth devices, audio output over AirPlay, and HDMI with the help of the Apple Digital AV Adapter. Allows copying pasting of audio from supported apps into GarageBand. Import of WAV, AIFF, CAF sound files and Apple Loops (16 bit, 44.1 kHz). Fixed issues where in GarageBand freezes while Smart Instruments are played. Improves overall GarageBand stability and addresses other minor issues. Posted by Anonymous on Tue, 06/28/2011 - 00:08. This is by far the best value for money app in the entire app store! Posted by Anonymous on Wed, 06/15/2011 - 04:22. Garage band is the best iPad App by miles! Posted by Jason on Mon, 06/06/2011 - 07:37.